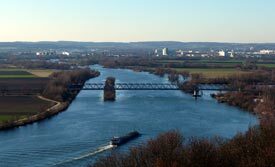 ABOVE: The Danube River is the most pleasant route to Walhalla. Excursion boats offer roundtrip service from the Steinerne Brücke in Regensburg. Walhalla is near the village of Donaustauf, approximately 10 km or 6 miles east of Regensburg. If you're driving, allow an extra 15 or 20 minutes to visit the ruined fortress in Donaustauf. Excursion boats: The best way to reach Walhalla is by boat from the Steinerne Brücke (Stone Bridge) in Regensburg. Klinger GmbH offers a roundtrip voyage with a 1¼-hour layover at Walhalla, where you'll need to climb up the hill to visit the monument. The boat tour's narration is in German and English. On some days, Klinger offers a boat excursion that substitutes a harbor tour for the layover at Walhalla. This is a good alternative if you aren't able to climb 358 steps and are willing to settle for a view of the monument from the river as the boat turns around. April - September: 9 a.m. - 5:45 p.m.
October: 9 a.m. - 4:45 p.m.
November, March: 10 - 11:45 a.m., 1 - 3:45 p.m.
Closed December 24, 25, and 31 and Shrove Tuesday. Note: Fees are charged for admission to the temple of fame and for parking.